And the word of the year is UNSTOPPABLE. In January I will hold quiet time sacred. EVERY MORNING. I’m definitely not saying it’s for everyone, but for me, I’ve got to get my heart and head right before putting foot to floor. In January I will stretch every a.m. before even getting out of bed. Waking up with pain has become a part of life. I literally can’t stand on my feet without a warm up. With a few minutes of doctor recommended stretches, though, I can get my back to stop spazzing, get my hip feeling 32 instead of 92 and convince my feet to do their job. In January I will drink more H2O… hydration is survivals first priority… and frankly, survival sounds like a good plan. 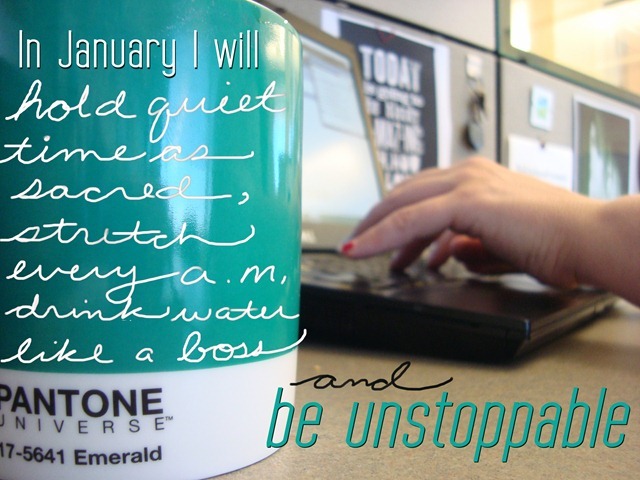 In January I will be UNSTOPPABLE. ‹ PreviousGoodbye 2012, Hello Lucky 13!